placed on the front surface of teeth to beautify your smile and enhance your appearance. They are used mainly to address aesthetic rather than functional problems in the anterior and posterior teeth. WHEN WOULD A DENTAL VENEER BE USEFUL? Dental veneers are not a good choice when the individual has an abnormal occlusion, or has habits such as teeth clenching or grinding. It may also not be useful in teeth with severe discolourations, severe rotations, bulky fillings or when a lot of the tooth structure (including enamel) has been lost. The procedure usually takes two visits but can take a single visit. The dentist will introduce himself to you and explain the procedure. He will assess the hygiene and health status of your teeth. He will take the shade of your teeth using a shade guide so that the veneer colour shade is similar to your natural teeth colour. He will prepare the teeth using a bur to remove about half a millimeter of enamel and take an impression of the teeth. 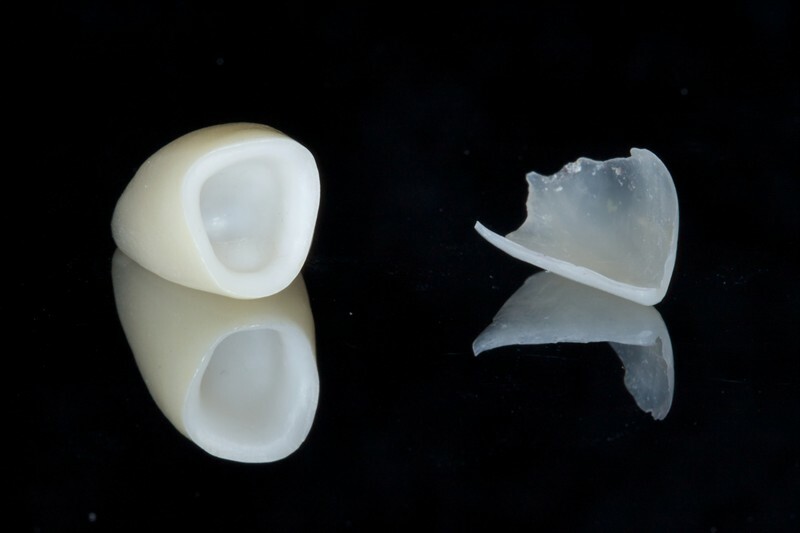 At the end of the first visit, a temporary preformed veneer usually made of acrylic is placed over the prepared teeth. At the second visit, the temporary veneer is removed, the teeth is cleaned and dried. The definitive veneer is tried in and cemented if it is satisfactory. The veneer is finished and post-procedure instructions are given. Typically, a veneer lasts approximately 5-10 years. They do not require any special care other than regular brushing, flossing, and visits to the prosthodontist. If they are properly cared for then they can last much longer. Professional cleanings every 6 months and yearly exams are highly recommended. You care for the veneers the same way you do regular teeth. That is, brushing two times each day for two minutes, flossing daily and avoiding hard foods like bones. Wearing a mouthguard at night can protect your veneers from tooth grinding. This concern will be addressed by your prosthodontist. Most people get their veneers in a whiter shade than their natural teeth and then undergo tooth whitening to create a matching aesthetic.